A recent article (paywall) in the Wall Street Journal details the efforts of gas and oil pipeline companies to enlist drones in the inspection of their lines. U.S. utilities see great potential in the use of remote-controlled drones to do the often-dangerous work of inspecting power lines and transmission towers but strict regulations have so far slowed adoption of the technology. Pipeline inspection, along with other mundane flying such as banner towing or crop dusting has long been a staple of inexperienced pilots looking to build flying time. Pilots needing to build hours and gain experience would do these jobs for little pay in hopes of being eventually picked up by a commuter or cargo airline as a copilot. Then, after building hours and eventually making it to the left seat of a commuter or cargo aircraft an aspiring pilot could then hope to be hired on by a major airline. Drones, coupled with new government regulations quintupling the numbers of hours required to even be hired by a commuter airline, have disrupted this process. Together, these two developments form an effective one-two punch to knock prospective pilots out of the game. Utilities spend millions of dollars inspecting power lines, which are often in hard-to-reach places. The industry has been interested in the potential use of drones for years, but has been slower than European companies to adopt the technology because of U.S. regulatory restrictions. 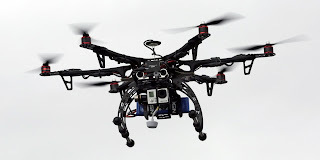 Other industries, including oil and gas drillers, pipeline operators, construction companies, and agriculture are also investigating the use of drones to make inspection and mapping tasks faster, more accurate, safer and less costly. "With wind turbines, you'll have a couple of guys hanging off the blades by a rope a couple hundred feet in the air to do inspections visually, at a cost upwards of $10,000 per site," Bordine said. "We can get the same results with a UAV for $300, without putting workers in danger." What this means is that for a young person hoping to become a pilot, the journey will include borrowing the better part of $100K to pay for the flight time which was previously built by flying a banner tow or pipeline inspection aircraft. The military is also doing a much better job of retaining pilots through the use of long commitments in exchange for pilot training. For those lucky enough to already have their ratings, these developments mean assured employment and increasing wages...at least until such time as automation eliminates pilots from airliners entirely.